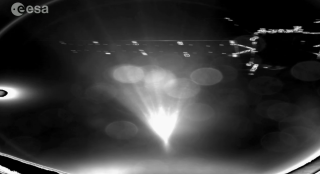 This photo from the Philae lander shows ESA's Rosetta spacecraft as seen from the lander during its descent to a comet's surface on Nov. 12, 2014. A European spacecraft is attempting to make history by landing on a comet in deep space, and amazing new photos show the daring endeavor in action. The European Space Agency's (ESA) Philae lander took one image of the Rosetta spacecraft orbiting Comet 67P/Churyumov-Gerasimenko during the lander's descent onto the icy cosmic body. Rosetta also snapped some photos of Philae heading down to the comet. Mission controllers are expecting to find out if Philae landed safely on the comet by around 11:02 a.m. EST (1602 GMT). You can watch coverage of the historic landing live on Space.com via ESA. Rosetta's view of the lander's descent shows Philae's landing legs properly deployed, and the spacecraft should be in the right position for its landing, ESA officials said. ESA's Rosetta spacecraft sent back this image of Philae lander as it descended towards Comet 67P-CG on Nov. 12, 2014. This image was taken at maximum zoom. ESA's Rosetta spacecraft sent back this image of Philae lander as it descended towards Comet 67P-CG on Nov. 12, 2014. "We've given up the careful control we've had over this spacecraft for years and years and years," Mark McCaughrean senior science advisor in ESA's directorate of science and robotic Exploration, said during a webcast today. "It's all down to Isaac Newton now. It's down to the laws of physics. We are on the way to the surface … If Isaac is friendly to us, then we'll have a great landing later on today. "Rosetta's images show Philae's landing gear deployed, and the lander is in the proper position for its touchdown on the comet's surface. Scientists on Earth are now in contact with Philae during its descent, but ESA officials experienced a tense few minutes while waiting for the small probe to call home through a connection with its Rosetta carrier craft. Mission controllers are now reporting that Philae's landing gear is deployed and everything appears to be behaving normally. Once Philae lands on Comet 67P/C-G, the probe is expected to deploy a harpoon that will keep it attached to the icy world. It will then start using its 10 instruments to investigate the comet from the ground while Rosetta gathers data from orbit. The spacecraft and comet are currently flying through deep space about 317 million miles (510 million kilometers) from Earth. Scientists hope that Philae will continue functioning on the surface of the comet until March 2015, with the Rosetta orbiter studying the comet from orbit until December 2015. Rosetta should stay with Comet 67P/C-G through its closest approach with the sun in August 2015. It takes about 6.5 Earth-years for the comet to complete an orbit of the sun. Rosetta and Philae launched to space in 2004 and flew billions of miles through the solar system for 10 years before arriving at the comet in August. Editor's Note: This story was updated with new photos and information at 10:06 a.m. EST (1500 GMT).